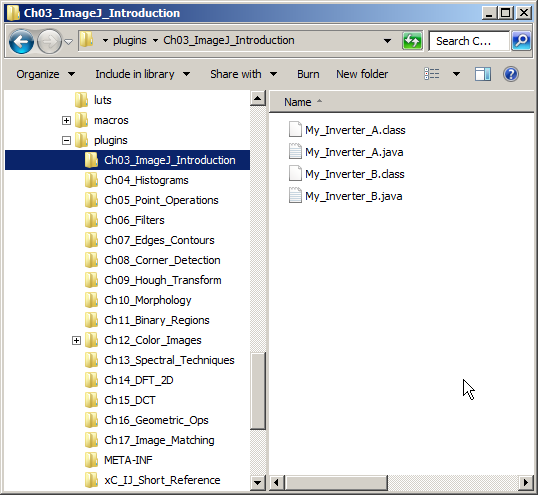 The plugin JAR files provided for the different book editions (https://sourceforge.net/projects/imagingbook/files/code/plugins/) are supposed to be downloaded and placed inside the ImageJ/plugins/ folder. If simply placed there, ImageJ should (after a restart) recognize the .jar file as a plugin container and show all plugins in the Plugins menu. However, this only works if the name of the .jar file contains at least one underscore character! All plugin archives were thus renamed tp BurgerBurgeXxx_plugins.jar. Users may either rename local files themselves or download a new copy. ImageJ/plugins folder structure after unzipping BurgerBurgeEn1_plugins.jar (for example). Mac users should be aware that the built-in Archive Utility always unzips to a new folder with the same name as the archive file. In this case, the contained book chapter folders must be moved up manually by one level (into the ImageJ/plugins/ folder). Romuald Perrot has reported some errors in the SIFT chapter (Ch. 7) of “Principles of Digital Image Processing – Advanced Methods” (Volume 3). Corrections can be found in the Errata section.